The phenolic acid profile of honey depends greatly on its botanical and geographical origin. In this study, we carried out a quantitative analysis of phenolic acids in the ethyl acetate extract of 12 honeys collected from various regions in Greece. Our findings indicate that protocatechuic acid, p-hydroxybenzoic acid, vanillic acid, caffeic acid and p-coumaric acid are the major phenolic acids of the honeys examined. Conifer tree honey (from pine and fir) contained significantly higher concentrations of protocatechuic and caffeic acid (mean: 6640 and 397 µg/kg honey respectively) than thyme and citrus honey (mean of protocatechuic and caffeic acid: 437.6 and 116 µg/kg honey respectively). p-Hydroxybenzoic acid was the dominant compound in thyme honeys (mean: 1252.5 µg/kg honey). We further examined the antioxidant potential (ORAC assay) of the extracts, their ability to influence viability of prostate cancer (PC-3) and breast cancer (MCF-7) cells as well as their lowering effect on TNF- α-induced adhesion molecule expression in endothelial cells (HAEC). ORAC values of Greek honeys ranged from 415 to 2129 µmol Trolox equivalent/kg honey and correlated significantly with their content in protocatechuic acid (p < 0.001), p-hydroxybenzoic acid (p < 0.01), vanillic acid (p < 0.05), caffeic acid (p < 0.01), p-coumaric acid (p < 0.001) and their total phenolic content (p < 0.001). Honey extracts reduced significantly the viability of PC-3 and MCF-7 cells as well as the expression of adhesion molecules in HAEC. Importantly, vanillic acid content correlated significantly with anticancer activity in PC-3 and MCF-7 cells (p < 0.01, p < 0.05 respectively). Protocatechuic acid, vanillic acid and total phenolic content correlated significantly with the inhibition of VCAM-1 expression (p < 0.05, p < 0.05 and p < 0.01 respectively). In conclusion, Greek honeys are rich in phenolic acids, in particular protocatechuic and p-hydroxybenzoic acid and exhibit significant antioxidant, anticancer and antiatherogenic activities which may be attributed, at least in part, to their phenolic acid content. This new study finds that Bee Venom Therapy (BVT) has positive results on ALS symptoms, but those who've been using BVT for ALS, MS and various forms of Arthritis can already attest to its benefits. This is promising news for ALS sufferers, as use of the other bee products have been proven to aid and prevent neurodegenerative diseases. Amyotrophic lateral sclerosis (ALS) is a devastating progressive neurodegenerative disorder characterized by a selective loss of motor neurons in the spinal cord, brainstem, and motor cortex, leading to weakness of the limb and bulbar muscles. Although the immediate cause of death in ALS is the destruction of motor neurons, ALS is a multi-organ disease that also affects the lungs, spleen, and liver. Melittin is one of components of bee venom and has anti-neuroinflammatory effects in the spinal cord, as shown in an ALS animal model. Melittin is a 26 amino acid protein and is used in traditional Chinese medicine to inhibit cancer cell proliferation and is known to have anti-inflammatory and anti-arthritic effects. These findings suggest that melittin could be a candidate to regulate the immune system in organs affected by ALS. 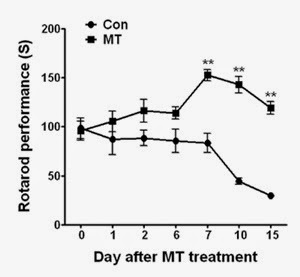 Our research suggests a potential functional link between melittin and the inhibition of neuroinflammation in an ALS animal model. It's well-documented that propolis accelerates the wound healing process and this new study provides yet another critical application for its healing properties. 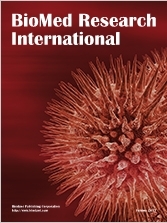 The authors define propolis as "one of the most promising candidates for burn wound management". The aim of the study was to assess the propolis effect on fibronectin metabolism in the course of burn wounds healing process. A model of burn wound healing of pig skin was applied. The amount of the released glycoprotein was assessed by a surface plasmon resonance. The profile of extracted fibronectin components was also assessed by an electrophoresis in polyacrylamide gel, with a subsequent immunodetection by Western Blotting. Propolis burn treatment decreased the release of fibronectin components from healing wounds in relation to damages treated with silver sulfadiazine. The main reason of decreased extraction of fibronectin components from wounds treated with propolis was a substantial decrease of degradation product release of the mentioned glycoprotein, which was observed particularly from the 3rd to 5th day of the repair. 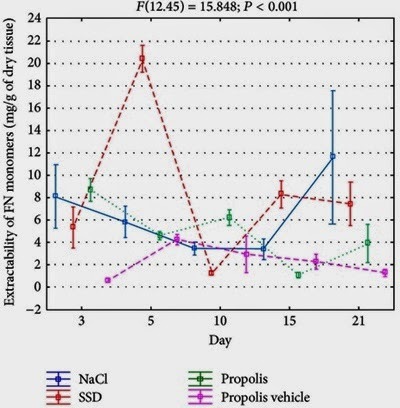 Wounds treatment with propolis demonstrated, especially in relation to damages treated with silver sulfadiazine, the decreased release of synthesized fibronectin molecules. The obtained results suggest that propolis modifies fibronectin metabolism in the course of wound healing process. The influence of propolis is reflected in prevention of fibronectin biosynthesis as well as its degradation in the wound area. The above-mentioned metabolic changes may decrease the risk of complications in the repair wounds process. This trial was designed to evaluate the efficacy and safety of topical honey eye drops in patients with diagnosed VKC. This clinical trial was conducted on 60 patients with diagnosed VKC. The patients were selected and randomly allocated between two groups of 30. Patients in two groups received honey eye drop (60% in artificial tear) or placebo, other than cromolyn and fluorometholone 1% eye drops, to be used topically in each eye, four times per day. 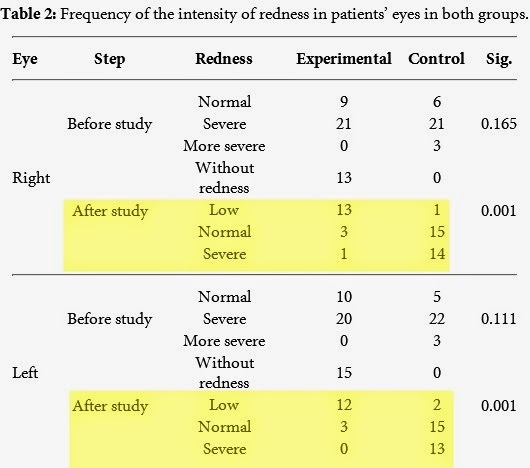 The patients were examined with slit lamp and torch at baseline and the follow-up visits on the 1st, 3rd, and 6th months of the study for redness, limbal papillae, and intraocular pressure. female. There was significant increase in eye pressure and reduction in redness as well as limbal papillae, following the consumption of the honey drop in honey group compared to placebo control group (P < 0.05). At the end of trial, one patient in honey group and 7 in placebo group had limbal papillae (P < 0.05). Topical honey eye drops, when used along with Cromolyn and Fluorometholone eye drops, might be beneficial for the treatment of VKC. It might be used to reduce the amount of steroid consumption. However, more research is needed to determine how much it can reduce the need for steroid usage. 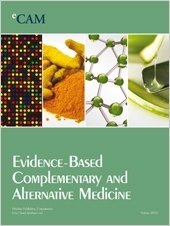 The use of complementary medical treatment in wound management has continued to grow throughout the world. There is a large body of evidence that supports the use of honey as a wound dressing for a wide range of wound types. The authors present an update of present knowledge about honey as a form of complementary medicine in paediatric wound management. The literature cited was found by searching the PubMed, BIOSIS and ISI Web of Science databases for the phrase 'honey and wound'. Papers where honey was used in a mixture with other therapeutic substances were excluded. Randomised controlled trials as well as case studies were taken into consideration. This paper reviews data on the effectiveness of honey in wound healing; 80 citations or references were found that matched the criteria. Furthermore, the wound-healing properties of honey are described and the mechanism of action discussed. The authors' data show that honey induced enhanced epithelialisation, minimised scar formations and had an anti-microbiotic effect. These results should encourage the use of medical honey in the field of paediatrics. It is a safe and natural substance that induces wound healing at a greater rate than conventional methods.